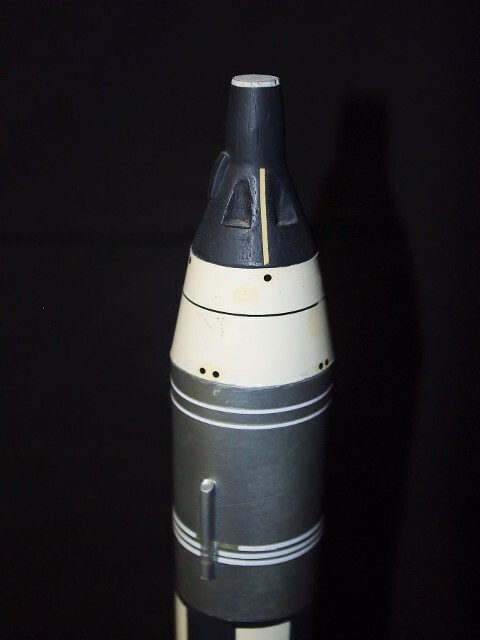 An original Estes "Maxi Brute" German V-2 Rocket, 1/19 scale. Original release - 1974. 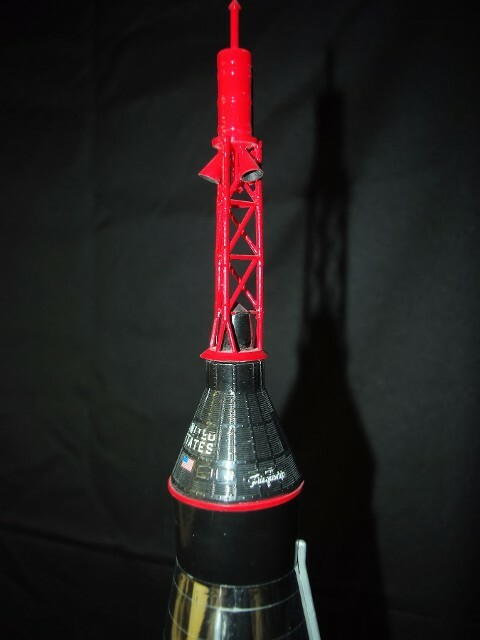 The bird used a single "D" engine and two 24" parachutes: one for the booster and one for the nose cone. 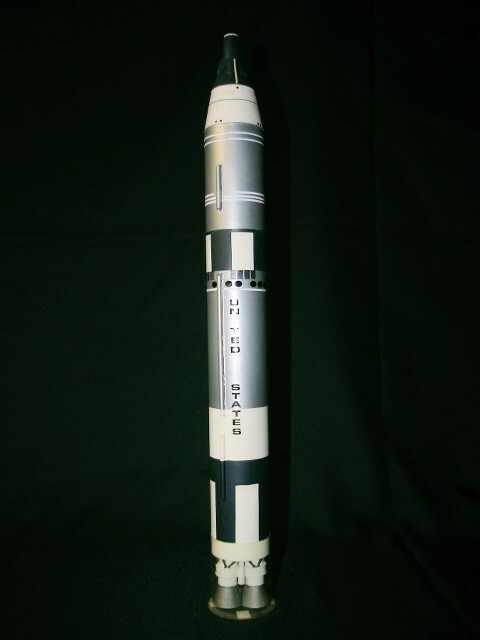 The German V-2 was the work of the VonBraun team and was the first successful IRBM used in warfare. 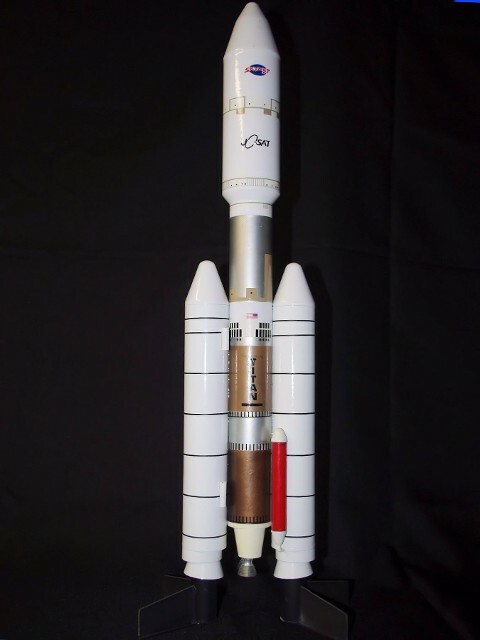 Scratch-built Russian Proton Booster. Built in 1984. Designed to fly on single "C" engine power withe a single 24" parachute. 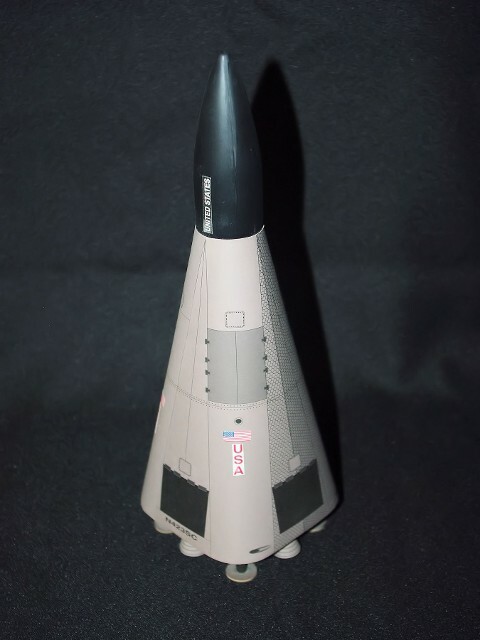 Estes Titan IIIE, in 1/73 scale. Original release - 1989. 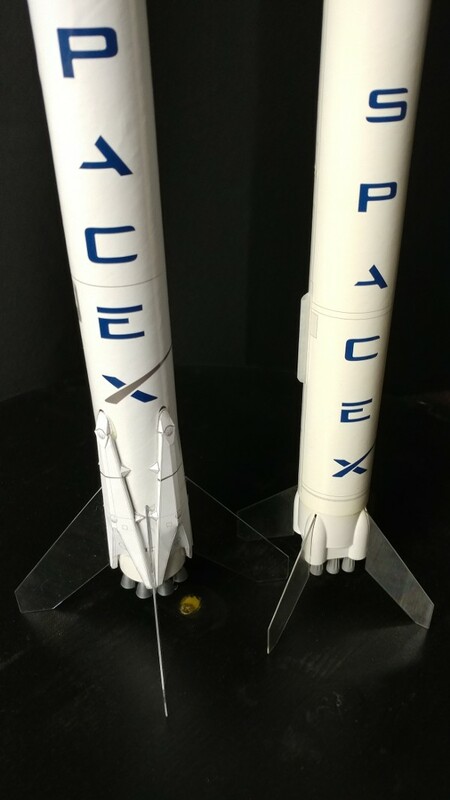 Hand-painted fairing emblems for two satellite owners: Skynet and JC Sat, as the Titan could loft two Hughes 360 Series telecom satellites at the same time. 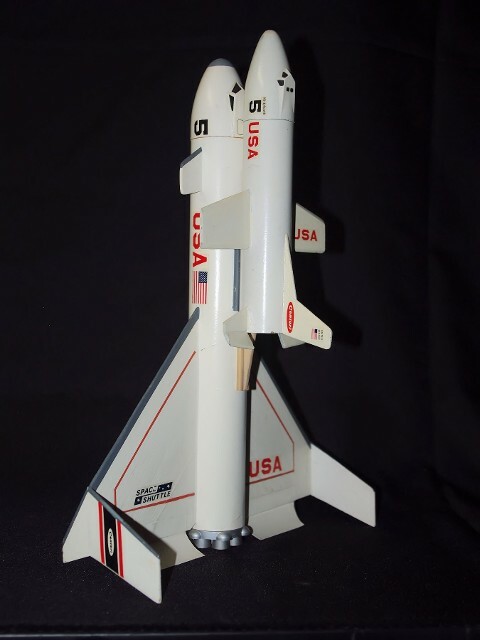 An original Estes Space Shuttle, in approx. 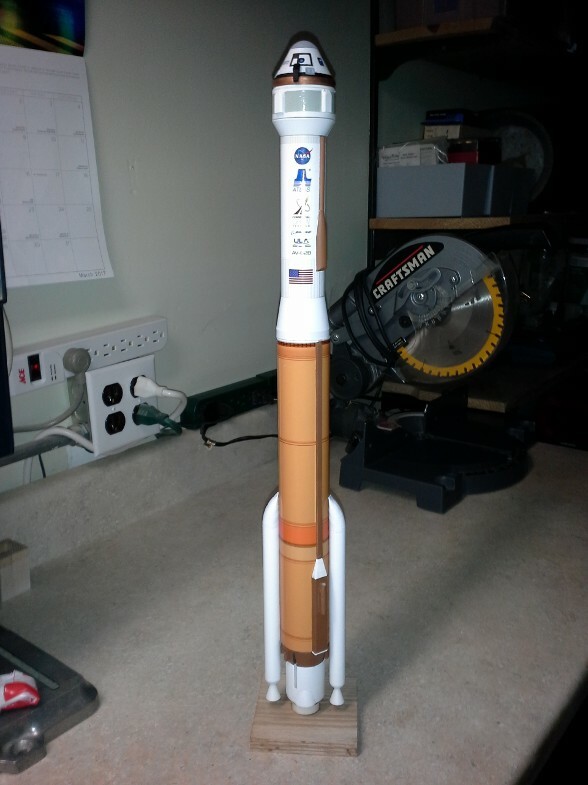 1/162 scale. Original release - 1977 - four years before STS-1 flew! The bird flies with only the C6-3 engine. At apogee, the Orbiter separates from the SRB-ET section, which glides back to a landing while the booster section returns by 18" parachute. At one time, I owned three of these. 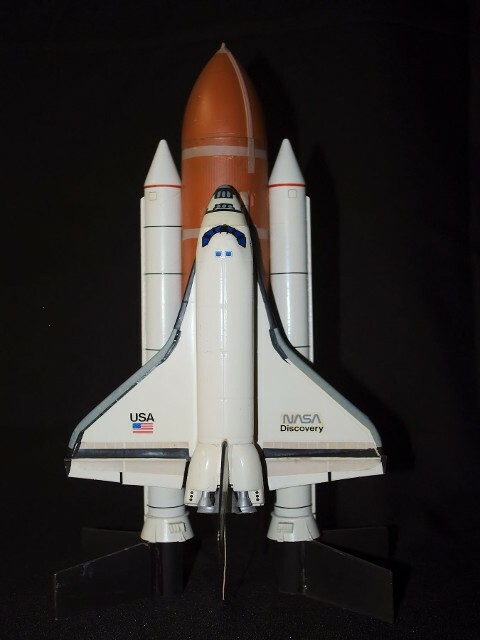 One badged as "Columbia" with a white ET, and two badged as "Challenger" and "Discovery" as each new Orbiter came "on-line." 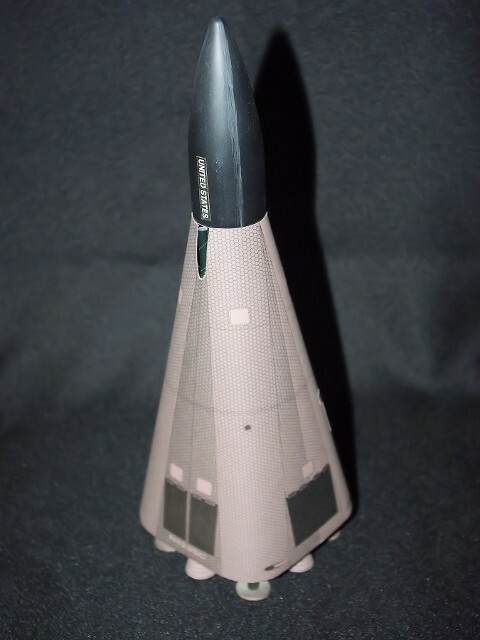 An original Centuri Space Shuttle. Original release - 1975. 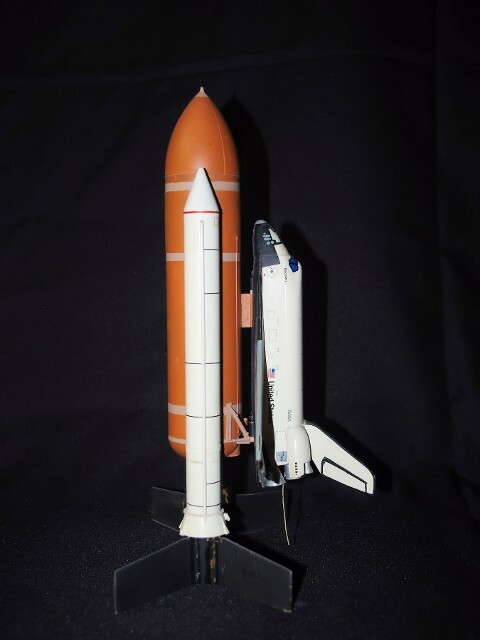 The model depicts and actually flies the way the original NASA Space Shuttle was supposed to - both the booster section and the Orbiter return as gliders - a fully reusable vehicle. The engine pod ejected itself from the Orbiter's tail at apogee. 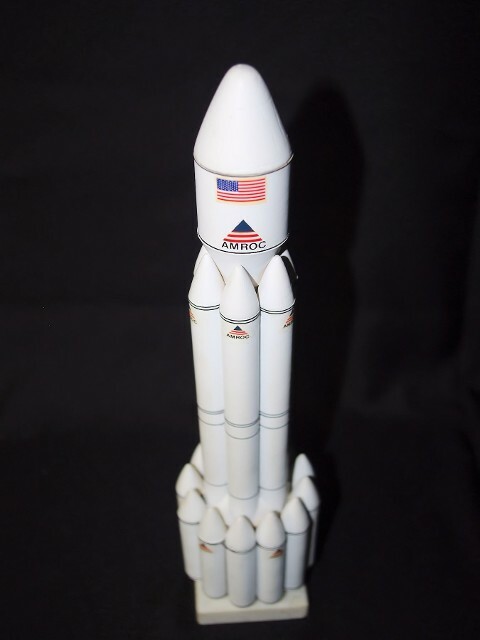 A scratch-built model of the American Rocket Company (AMROC) concept for their "Conestoga 2" modular hybrid commercial launch vehicle. AMROC went bankrupt before this bird ever flew. The model was based on drawings published in Aviation Week in 1988. 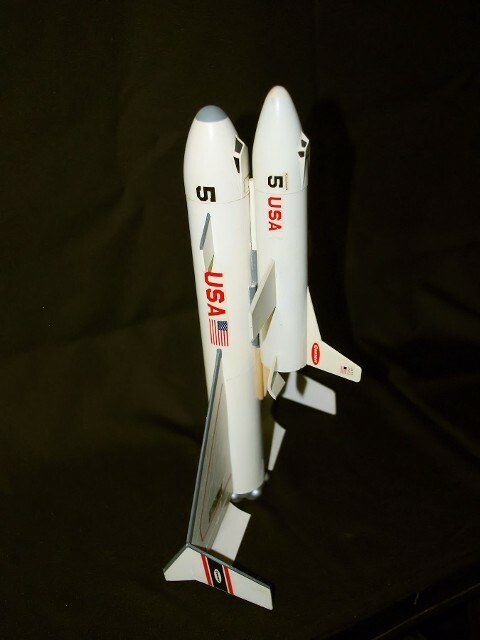 Centuri Industries' flying model of the McDonnell-Douglas "Delta Clipper" (DCX), which was the first prototype single-stage to orbit (SSTO) vehicle. The DCX made a number of successful test flights at Edwards Air Force Base, proving its ability to do vertical thrust-assisted landings, however, it never made it anywhere near orbit. 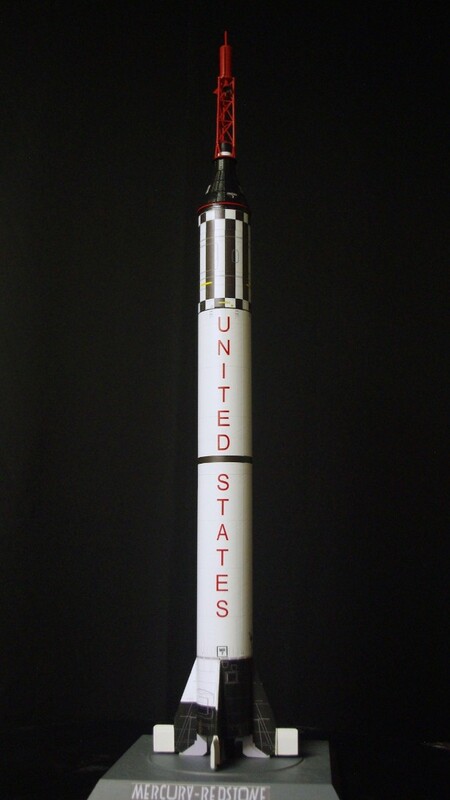 An original Estes Saturn 1B in 1/70 scale. Original release - 1967. 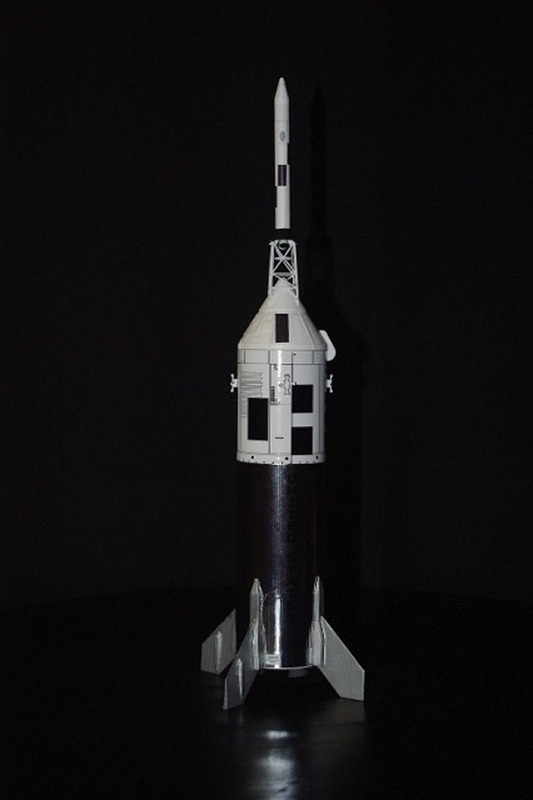 This is the second incarnation of this model I have built. The first was flown, damaged, repaired, and lost in flight after years of flight service. 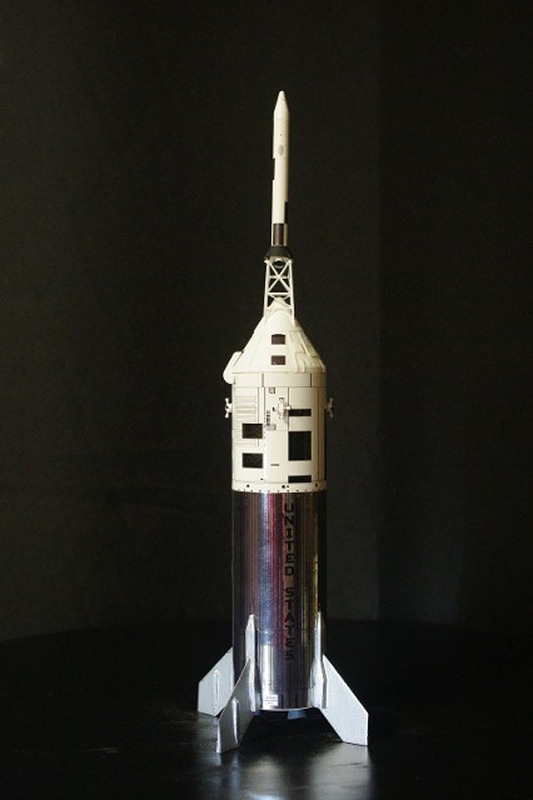 The model shown was built in 1980 and detailed for the flight of Apollo-Soyuz, the last flight of Apollo-Saturn. 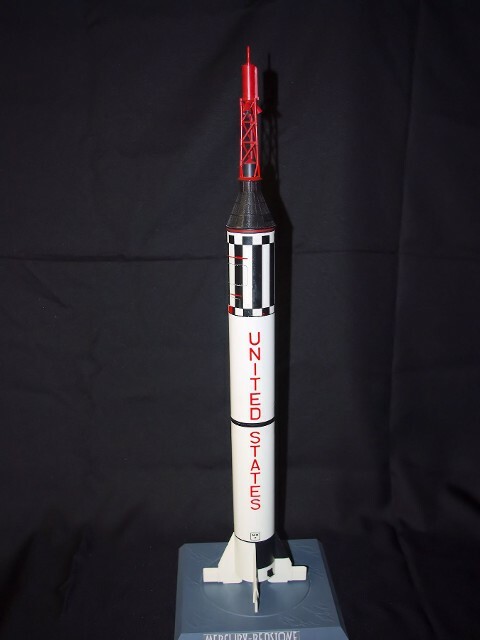 The model rocket flew with a four-engine cluster of B or C series engines. 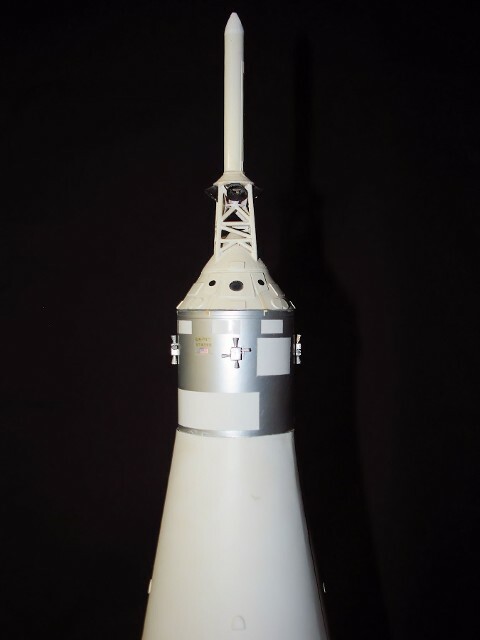 An original Estes Gemini-Titan II. Original release - 1966. The model is approx. 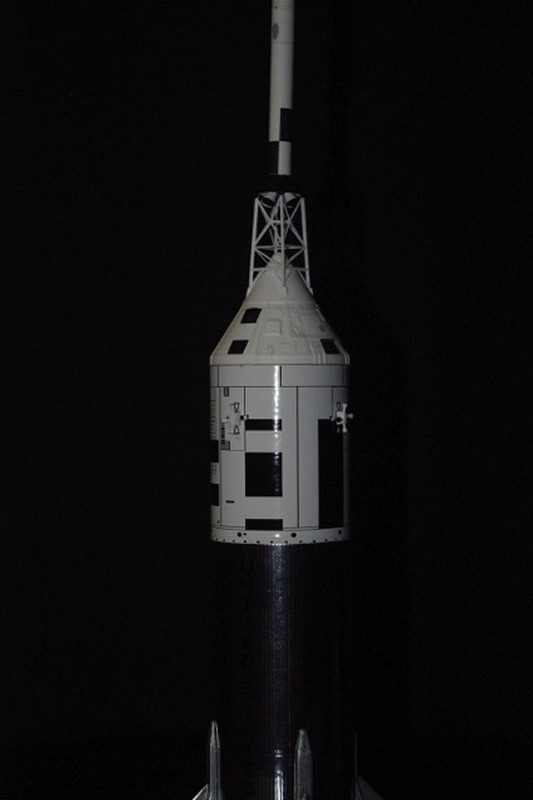 1/54 semi-scale and was the largest model of the Gemini-Titan available. The bird flew with a two-engine cluster of B or C series engines. 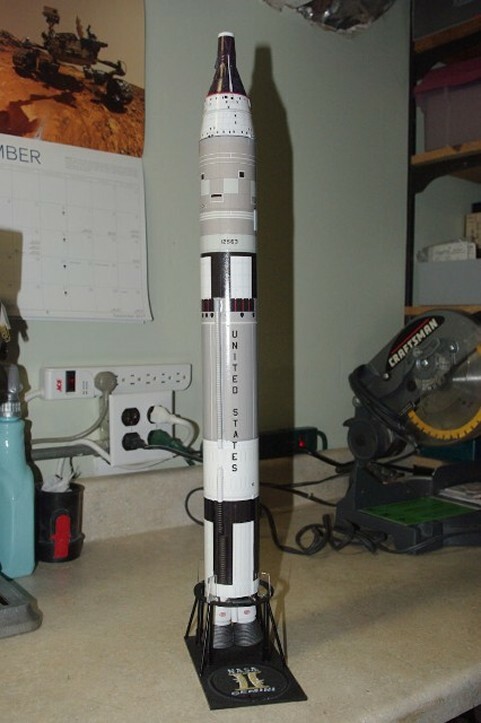 Here's the venerable Gemini-Titan II, after a recent renovation, using Accur8 Spacemodels "booster skins," Aerobotix 3D printed Gemini Spacecraft nosecone and LR-87 semi-scale engine covers. 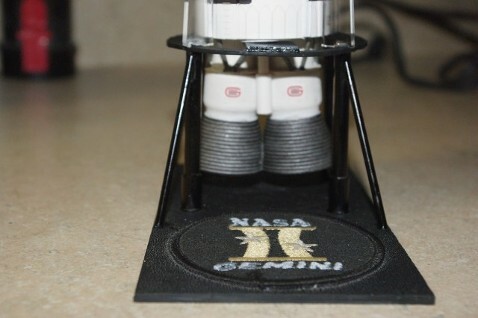 The Gemini spacecraft decals are custom-made, re-scaled versions of the Delta 7 Studios Gemini paper model renderings, printed onto white decal stock. 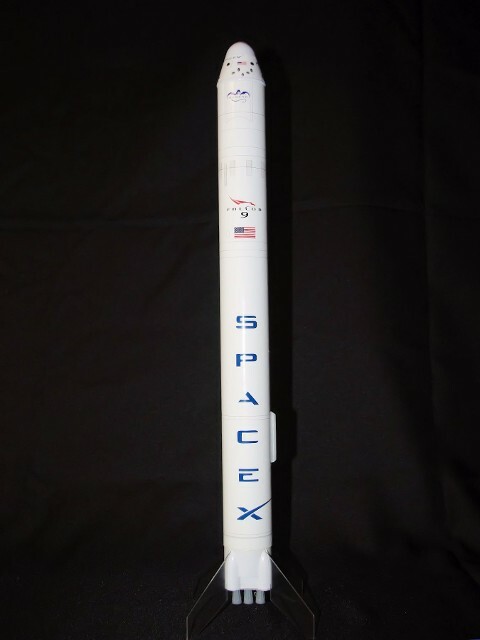 Originally released in 2010, the 1/86 scale model of the SpaceX Falcon 9 Commercial Rocket Booster model is now sold by SpaceX itself, but was originally available through Amazon.com. 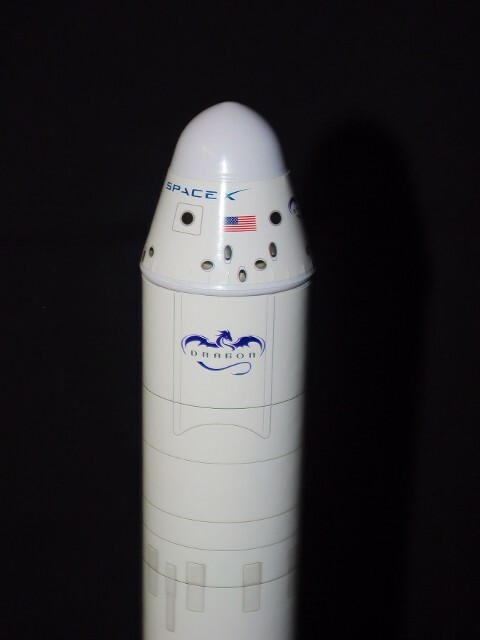 Now, SpaceX operates its own web store on its own website. 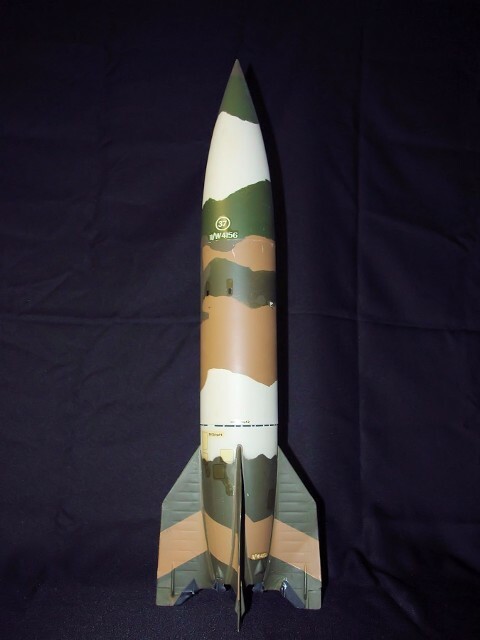 An original Estes Mercury Redstone Rocket in 1/42 scale. Original release - 1968. The single-engine model is badged for the flight of Freedom 7 (MR7), which made Alan Shepard America's first astronaut in a suborbital flight on May 5, 1961. We recently did a renovation of the Merc-Redstone, using "booster skin" applications made by Accur8 Spacemodels to add new detail and realism to the Redstone Booster. 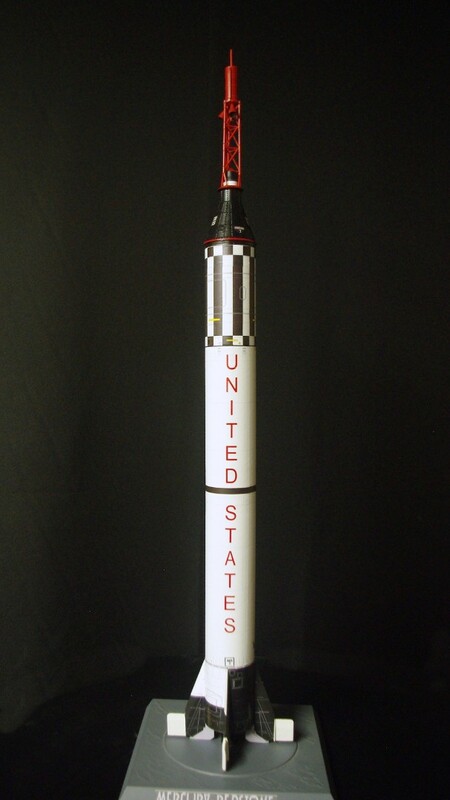 We made new "United States" and "Freedom 7" insignia decals for the spacecraft and the results were outstanding. 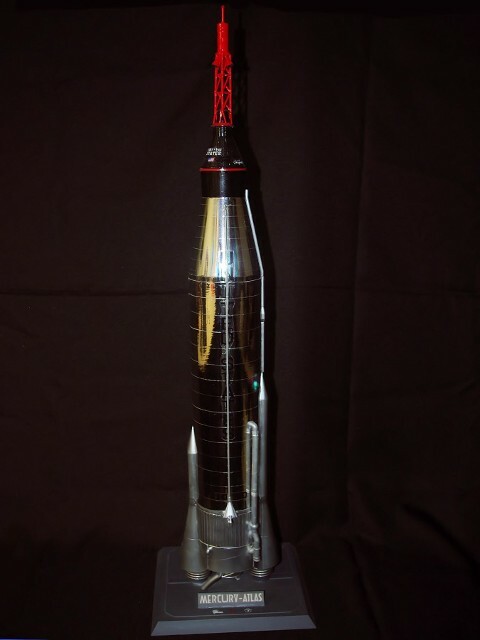 The Estes model of the Jupiter C rocket which placed Explorer 1 into orbit, marking America's first Earth-orbiting satellite. 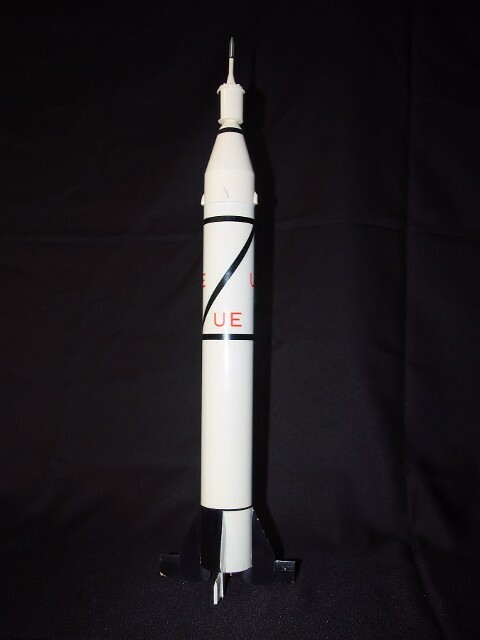 The model is in the same scale as its cousin, the Mercury Redstone -1/42 scale. Original release date - 1987. 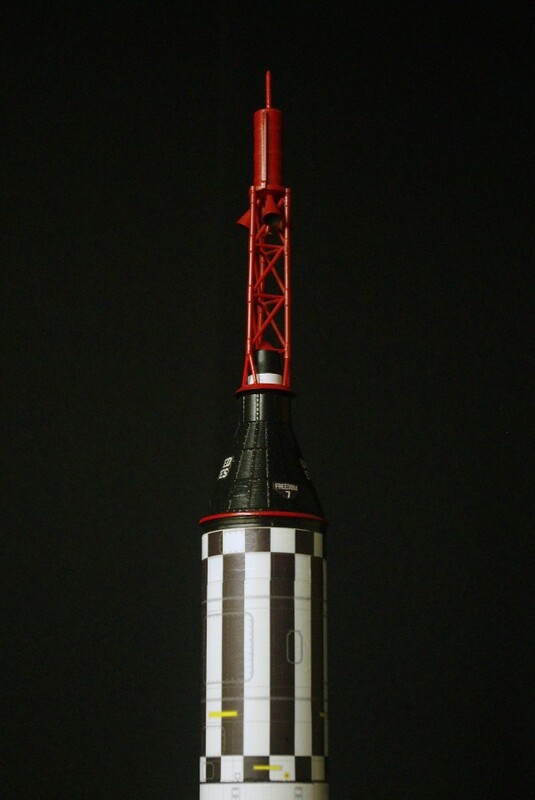 The Estes Mercury Atlas in 1/42 scale, the same scale as the Mercury Redstone and the Jupiter C. Original release date - 1995. 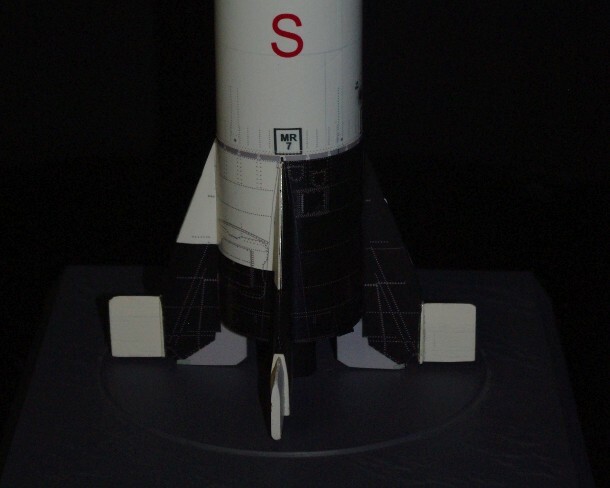 The use of aluminum coated self-adhesive panels for the Atlas booster made this one of the most realistic-looking models ever made of the booster, as Atlas' skin was thin stainless steel. 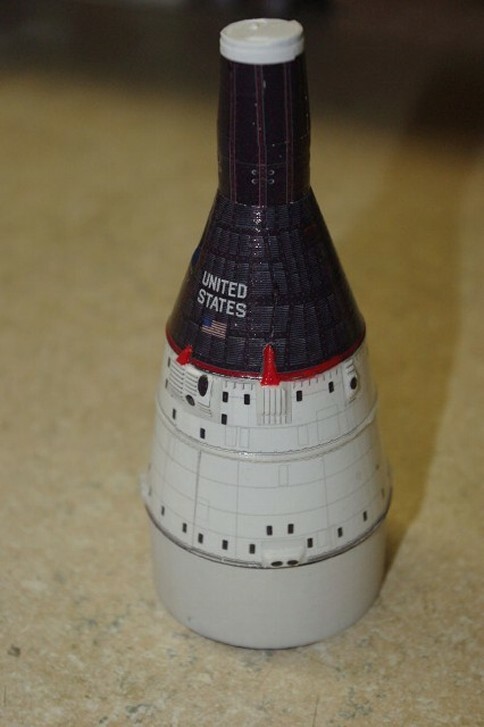 The model is badged for the flight of MA-6, "Friendship 7" which took John Glenn into orbit for the first time in the American Space Program on February 20, 1962. The RSR flying model is in 1/92 scale. 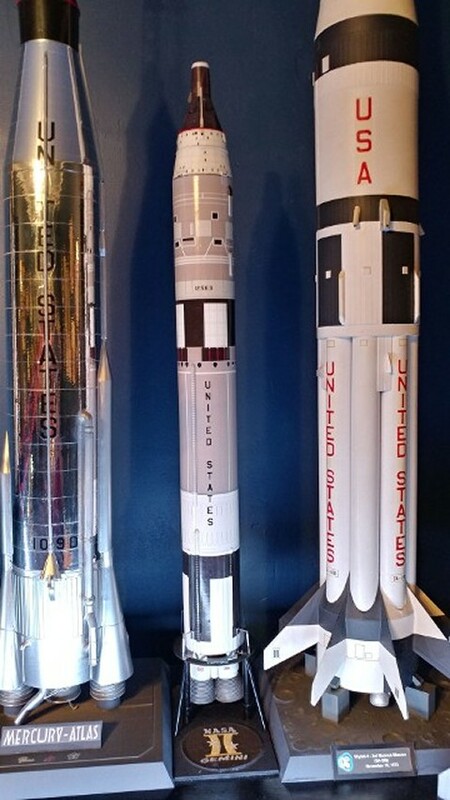 The model depicts the configuration which should begin unmanned test flights by the end of 2017 and manned flight operations sometime in 2018. 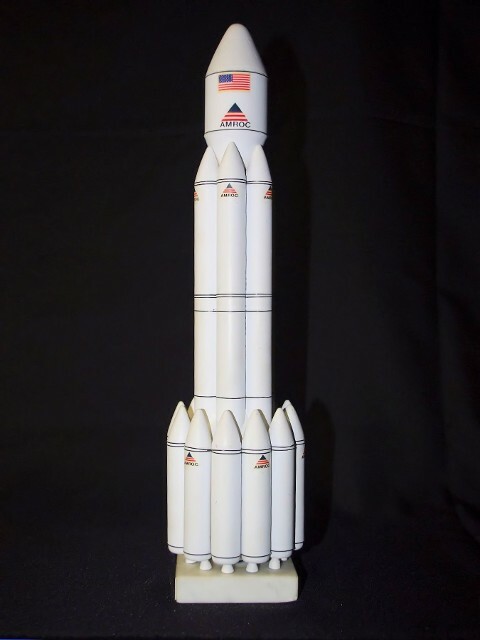 The model provides pre-printed body tubs for the Atlas booster and the Centaur upper stage, and 3D printed elements for the Atlas aft section, solid rocket motors and the Starliner spacecraft. 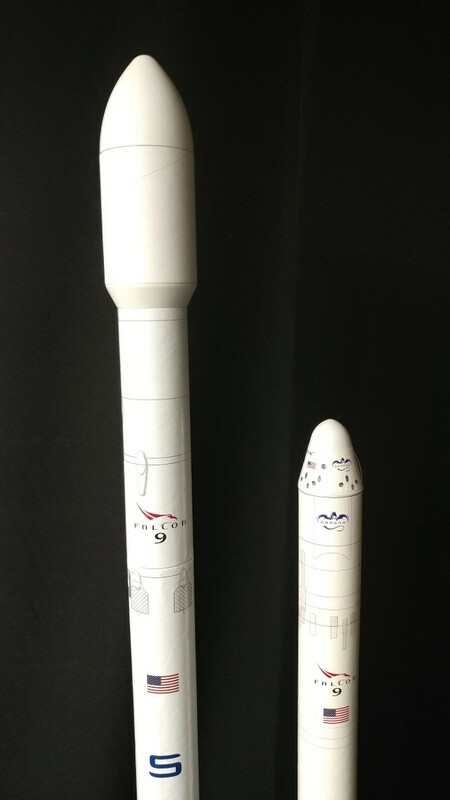 We added our own "launch livery" markings, as they are normally part of ULA - Atlas launches. They include the responsible agency (NASA) the Commercial Crew Program logo, the Atlas program logo, the Boeing logo (CST-100) and the Unites Launch Alliance logo, the operators of the Atlas V vehicle. The "AV208" is a simple "flight sequence" indicator, chosen to emulate Boeing artwork of the flight vehicle. 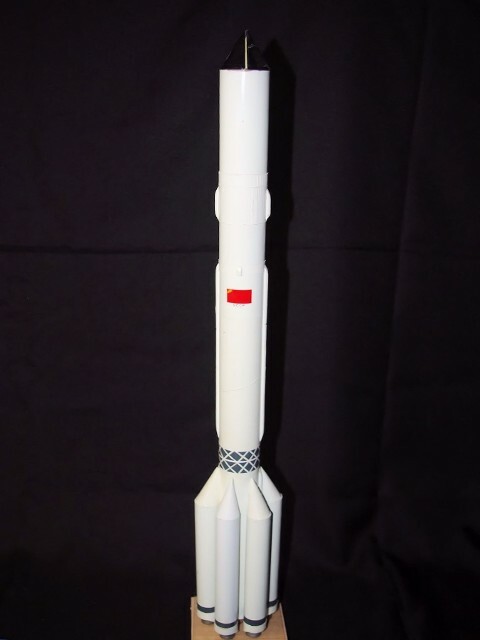 The SpaceX Falcon 9 Version 2 model is roughly in 1/86 scale, as was the original Version 1 model. 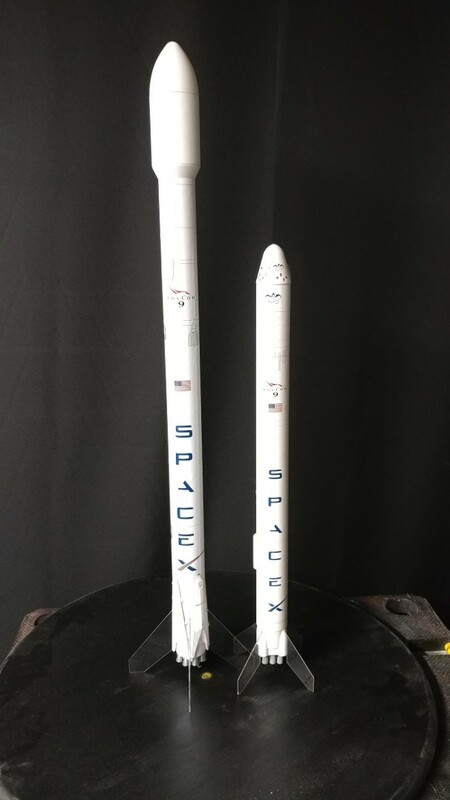 The new model depicts the configuration which began flying the end of 2015 and performed six successful first stage landings, both on land at Cape Canaveral's Landing Zone 1, as well as on the SpaceX drone ships at sea, while delivering the second stage and payload into low Earth orbit. 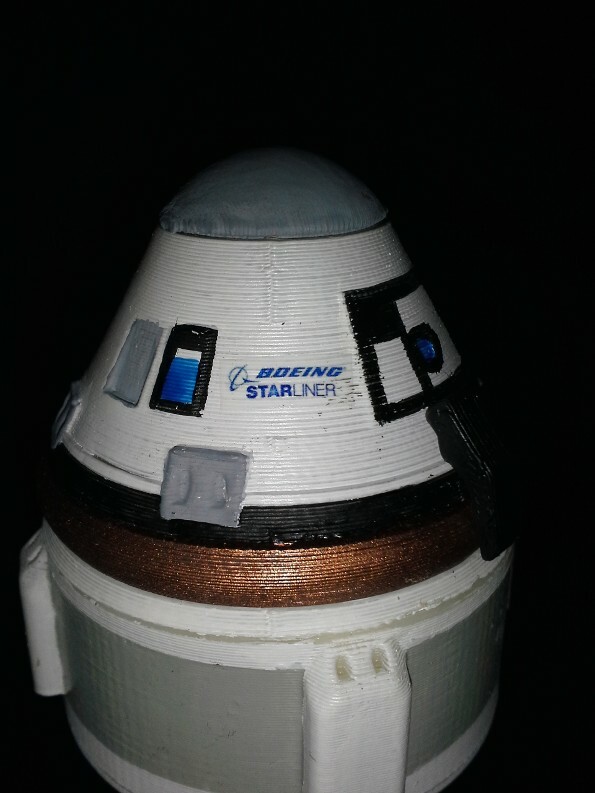 The model was provided with a pre-printed body tubes for the booster and black foam "sticker" applications to mimic the landing gear on the flight model. 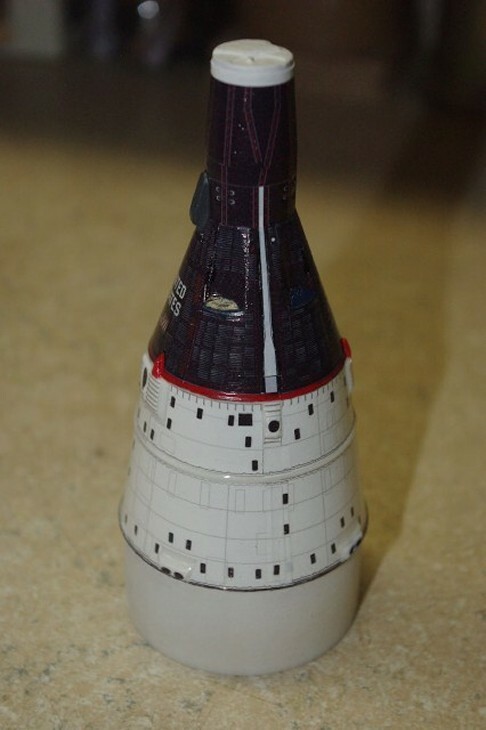 The black stickers left us a bit "cold," so I downloaded the necessary parts from the AXM Paper Space Models website, re-scaled them to 1/86, printed them out and applied them onto their locations on the booster. 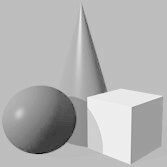 The dimensionality of the formed paper parts does a lot to make the model more realistic. 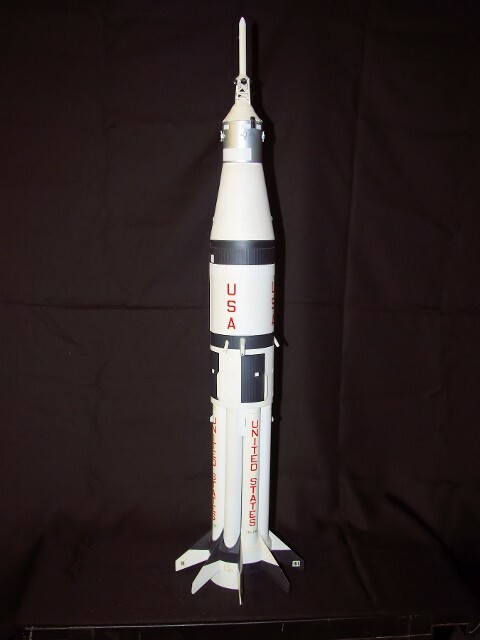 This Real Space Rockets model is sold by Apogee Components and it very faithfully depicts the General Dynamics Little Joe II solid propellant-driven test rocket, used in the mid 60's to test the Launch Escape System of the Apollo Spacecraft. 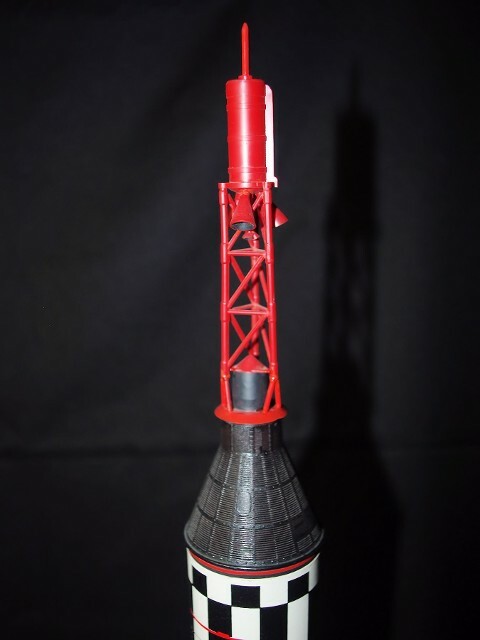 It features a fully-wrapped body tube, which provides good surface details, an injection-molded Apollo Command Module and LES Tower, 3D Printed fins and full-color decals. 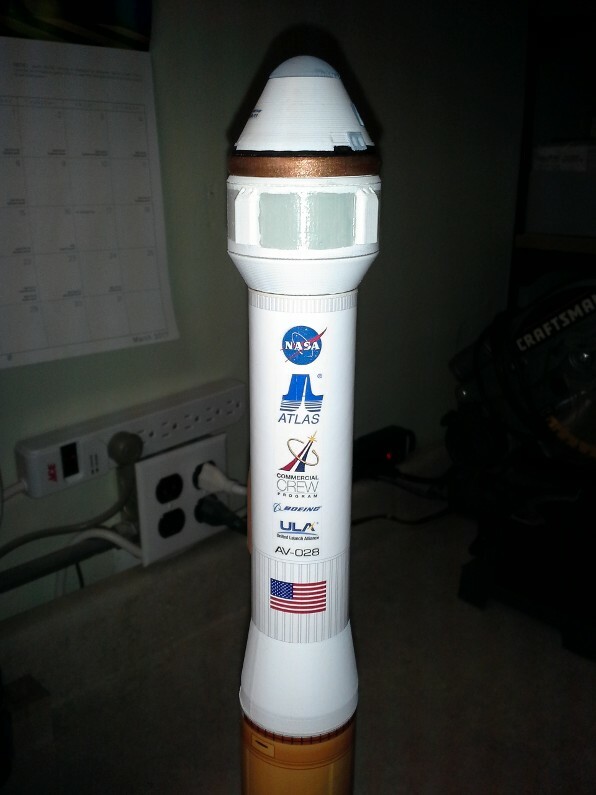 We added our own solid motor nozzles to the base for static display.